This is a book about new beginnings. After reading it and finishing it I still have a smile on my face. All of the characters in this book has come face to face with the loss of a loved one that was close to them. Including the horse (King). Some was more tramatic then others but in the face of losing a loved one to death, being tramatic or not has no bearings on the pain one feels over it. Nicks death was definitely tramatic for Clay and their horse King since it happened during a tragic accident while doing a jump during the race. Even two years later both Clay and King where still dealing from his death and King would not let anyone but a select few even get close to him, that is until a worker at the ranch named Luke started treating King as if nothing had ever happened and King took right up with Lucas and quickly came to trust Luke more then he did others. This was the start of a new beginning. After months of getting to know one another better Clay and Luke started dating and hoping it would lead to a relationship but with all relationships there was issues to either overcome or to move on from one another to someone else. I really enjoyed this book because in lite of the tragedy of losing someone that was loved, there was hope of finding someone to love again and a new beginning. This is a book that showed no matter how much we believe that once we lose the person we love, life is not over. There is still someone out there for them and that happiness did not end when you lost one love because there is possibly another love that is just as great right around the corner. You just have to be willing to take the chance when it is presented to you. Wonderful job on this book Ariel. I am still smiling after reading it. This book was just WOW. I just can’t seem to get enough of Dreamspinners DreamSpun Desires series and this time we have Ariel Tachna weaving us into a story so complex and inviting. I loved how the author just brought you into the story and just would let you go until you finished. This story had love and heartbreak and was a very emotional book that you just can’t put down. This was a book about loss and recovering from that loss. I was glad that Clay had Luke to help him recover as I don’t think he would have been even half the man he is without have meet Luke. It was clear that the author hit the nail on the head when it came to recovering from a loss. The writing was great and I found this a very easy to read story and would recommend it to anyone who enjoys a very emotional story. 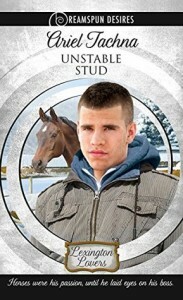 This is a simple Western romance between owner/trainer Clay and stable boy Luke. The story is a little bit Pretty Woman and a little bit Horse Whisperer. Down on his luck Luke is swept up by the affluent, older Clay when he forges a relationship with Clay’s most treasured horse. I requested this story because I love Ariel Tachna’s Lang Downs series and I was excited to see her writing about cowboys again. I should have taken note of the Harlequin-style cover though, because this is a much simpler, more cliched romance than anything I’ve read by Ariel Tachna in the past. I enjoyed the interactions between Luke and his horse, but I found myself feeling more than a little bit squeamish when Clay first enticed his much younger employee into his hot tub. This relationship never felt real to me. Luke looks like Clay’s former partner and he has the same relationship with Clay’s horse as the deceased man. All the way through, this relationship just felt a little bit creepy. I was never sure if Luke really had the ability to refuse his wealthy employer. So this is my first disappointment from Ariel Tachna and it’s probably just because I expect so much from her books.